At first glance, it's easy to mistake the elegant white structures that make up the Bayside Marina Hotel for shipping containers - and that's exactly what the architects intended! Yasutaka Yoshimura Architects based the components of the hotel on the form of the shipping container, stacking one of the minimalistic boxes atop another to form a roomy, light-filled seaside cottage. Since the container look-alikes are prefabricated and modular, they were able to go up with minimal impact on the site, and damaged or weathered pieces can be swapped out with no headache. 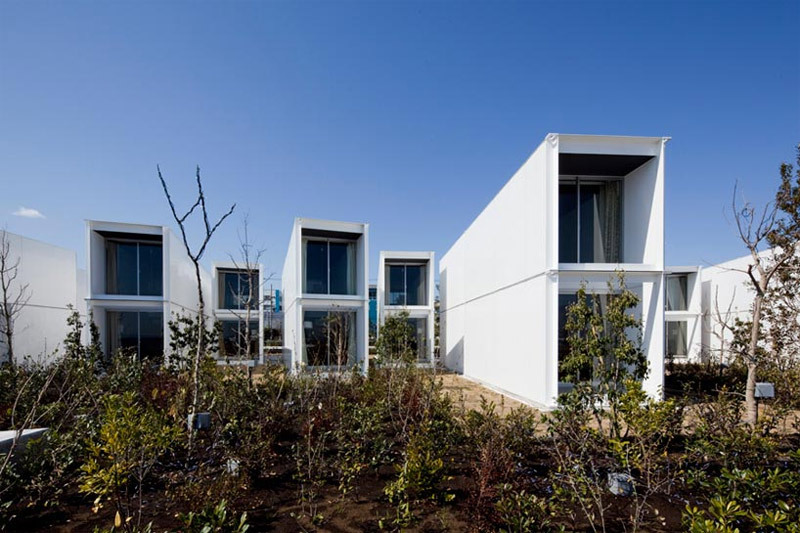 The hotel is located on the seaside of Yokohama where the cottages were staggered randomly on the site, giving the resort as a whole an organic look. Not much has been done to the land where the cottages sit aside from a few concrete slabs that act as pathways. In fact, it almost looks like the boxes were simply dropped there which is sort of the case since each container was prefabricated in Thailand, assembled in Japan, and then brought to the site. Inside each container, the living area has high ceilings and one entire wall of window. A minimalistic set of stairs leads to a loft-like sleeping area that overlooks the living room. A rather spacious bathroom sits right under the bedroom, making the most of the compact suite. You know where they can get prefab structures that look like shipping containers? From old shipping containers. 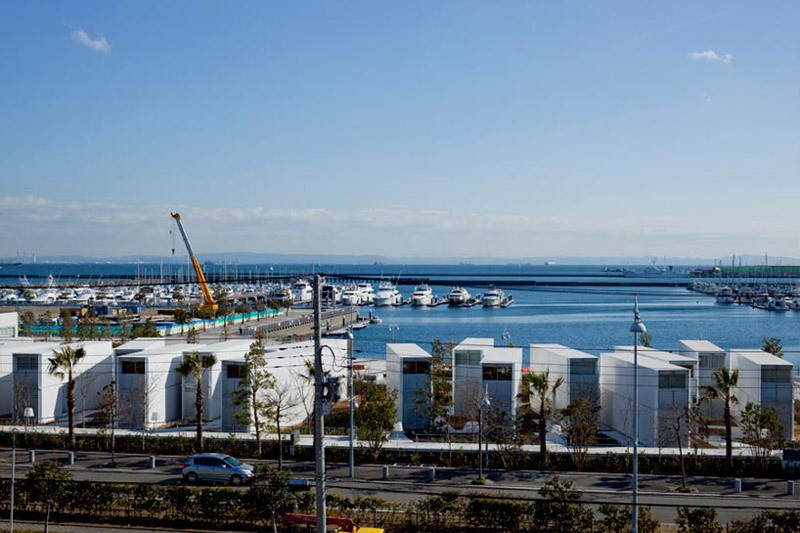 The hotel is located on the seaside of Yokohama where the cottages were staggered randomly on the site, giving the resort as a whole an organic look. Not much has been done to the land where the cottages sit aside from a few concrete slabs that act as pathways. In fact, it almost looks like the boxes were simply dropped there. ...which is sort of the case since each container was prefabricated in Thailand, assembled in Japan, and then brought to the site. Inside each container, the living area has high ceilings and one entire wall of window. A minimalistic set of stairs leads to a loft-like sleeping area that overlooks the living room. A rather spacious bathroom sits right under the bedroom, making the most of the compact suite. Each room has a different view thanks to the staggered design of the resort.